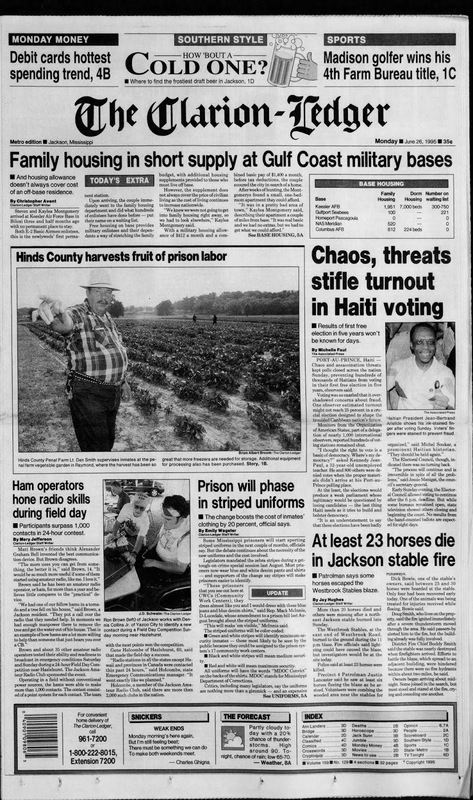 Jackson Jambalaya: Don't Call Convicts "Convicts"
Kinkaide said MDOC is looking at some type of colored shirt and dungaree uniform... Rest of article. 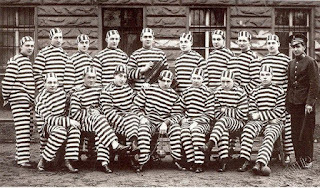 The legislature voted in 1994 to change the clothing from blue denim to the current striped clothes that state "MDOC Convict" on the back. Representative McInnis said at the time "We want a prisoner to look like a prisoner, to smell like a prisoner, and, ever who's going to do it, to taste like a prisoner. When you see one of these boogers aloose, you'll say, I didn't know we had zebras in Mississippi.." He continued during the legislative debate: "Some of them prisoners, you couldn't humiliate 'em with a humiliatin' machine." Let's also agree to remove self-esteem-threatening stuff like razor wire, doors consisting of iron bars and cold-aluminum commodes. Those things do nothing but diminish self-worth. Why are we paying for CONVICTS' clothing? This should be something provided by the CONVICT'S family - require the family to put funds in commissary to be used for DOC approved uniforms. Or maybe we can just get them a gift certificate to [insert your favorite urban wear store here] and they can blend in when the escape. I'm tired of these idiots coddling criminals, and not wanting to call something what it actually is because of feelings, or something. I can't say that this is the dumbest, least-needed piece of legislation advanced by the Mississippi legislature, but it damn sure ranks up there. In fact, it's not the dumbest piece of legislation Pelecia is pushing this year (her futile effort to hide everything from disclosure under the Public Records Act is number 1). But is this really a problem that deserves our highest attention and taxpayer dollars? Humiliation? Stigma? In prison? In the famous words of Charlie Brown: "Good grief." First, the vote was in 1995 not 1993. Secondly, it only passed the House by one or two votes. It was a stand alone amendment by Rep. McInnis, who was quite the comedian. Other than "why humiliate the inmates? ', the main argument against the amendment in 1995 was that it would cost about $1 million to switch from non-descript uniforms to striped uniforms. Today, the cost will again by about $1 million but the proponents say that MS Prison Industries can do it for less. MS Prison Industries ran well for about two decades but has lately been run into the ground by Gov. Phil Bryant and his people, who have turned it from a money-maker into a money-losing job fair for hiring their political cronies. Keep the stripes now that they are there. There are bigger issues to remedy at MS Dept of Corrections. I am one of the weird ones who believes there actually should be a stigma associated with being convicted and gong to jail. I don't believe it should be a place people DON'T mind going (or going back!) I also don't think it serves society well to have a place called prison that's generally no more than a good place to create more efficient criminals. No, if the inmates are hot/cold, uncomfortable, stigmatized by their clothing, etc., that's actually not a negative to me. With very few exceptions, they were in 100% control of whether they ended up in prison in the first place. Am I just a mean person? Lets not hurt their feelings. I for one believe that we had much less problems in 1960's and 70's when prisoners were made to work and when they got out there was a greater chance they would not return. But I forgot, we are giving them the right to vote now so they can vote on a Representative to get them new duds. She's a smart lady, but this is a headscratcher. Her department is begging for more money and she wants to blow a million on new uniforms? Medical costs increasing, her guards need a pay bump badly...but instead inmates are getting new clothes. Let's give them Marithe + Francois Girbaud jeans that are three sizes too big, Fubu shirts, Kangol hats, and Jordans with no laces. That way when they want to excape, all they have to do is walk away and blend in with the crowd. Build a tent city. Hell, I have to work in the outside elements. So they need comfort? This makes sense to me. At the hearing they said MS is one of only a couple states that do this. I don't think it's helped us in any way. When you consider that almost everyone in prison will be released at some point, they should really do a better job of preparing them to reenter the community. Uniforms that reflect real clothes is a step in that direction, even if a very small one. If you cage someone and treat them like an animal, they will act like one. If you call someone an "offender" they become even more conditioned to act this way. Corrections is meant to actually correct behavior, but that's not happening. I just pray to God that they don't go to tacky orange jumpsuits. Then, how will be able to tell the difference between dirty, violent, ignorant Tennessee fans and convicts? Bring back the barrel and cotton strap. Prison should not be a country club or a Criminal vocational Tec School. Ever hear a Criminal say Parchman Farm was a bad experience. Cons use to hate in and didn't want to go back. I would support a pink uniform with a bulls eye stripes on the back. I would much prefer that at least some of the inmates came out better people. 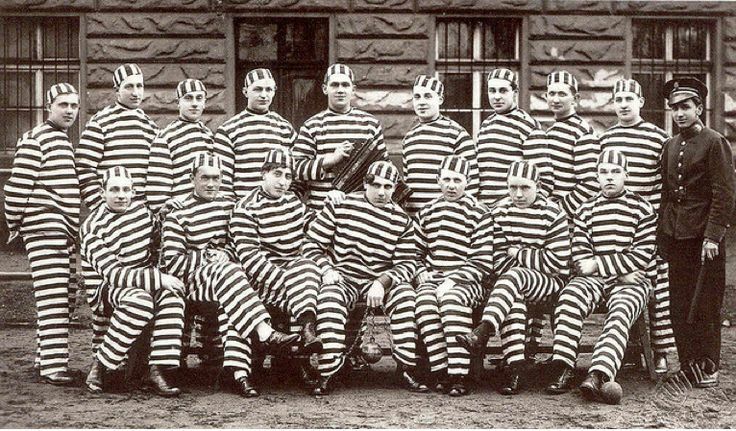 Not sure this if this would help any, but I certainly don’t think making them wear stripes has helped deter any crime in the past. Also, why can’t they just phase these in over a period as the old ones wear out? Something smells fishy with that extra $400k. If any change is required, replace the old clothing as they wear out. Shouldn’t be ONE RED CENT spent to keep from harming the sensibilities of Convicts and Politicans that feel this is needed. Maybe the new uniforms will have the Ralph Lauren Polo logo and come in different colors to reflect the different seasons of the year. That will make the convicts feel better about themselves. Joe Arpaio in Nevada had em living in tents and wore pink uniforms. Gave em bologna sandwiches too. I visit Gulf County Florida frequently and note there are three state facilities there. One is an "honor camp" which means the prisoners get to work on the roads, beaches, and other public facilities mowing and cleaning and of late doing hurricane recovery. It's an "honor" to be trusted to do the work and the folks doing the work get paid -- perhaps not much -- but best of all come home at night with the same feelings of self-worth that many non-convicts have. They put up signs that say "prisoners working ahead." "Convict" only means a person who has been convicted -- how is that bad? I do not hate or depersonalize prisoners. I do hate and depersonalize self-righteous pieces of doody who do (and communists, and homosexuals). I respect anybody who works -- at a profession, a trade, or on the chain gang. How would the "found guilty" feel about vertical stripes with a Chaps or Polo logo? Smells like "pay for play" with the vendor for the clothing. Just needed an excuse for the contract. Henceforth convicts will be deemed Mandatory Guests. It was only a matter of time before one convict asked another "Does this (horizontal stripes) make me look fat?" LOL. They have no shame. I want a lucrative gov’t contract, too. Where can I go to get one? Need a contract with a penal colony to send our convicted. Let’s get smart and build our own devils island. But, if you want to spend money on attire. Go knock yourself out! Most of our legislators will vote for anything. Political correctness meets the Mississippi Department of Corrections. Where does it end? They are convicts as I once was. Why not allow prisoners who so desire to buy a standardized, non-striped prison-appropriate uniform (like denims, khakis, etc. ), made at the prisons and sold at cost to the prisoners, for which they could ONLY (no money deposited from the outside) pay for with wages earned working in the various prison enterprises? You know, sort of like the real world - normal, honest folks must earn the money to pay for whatever wardrobe they desire. Those who don't want to buy it (or refuse to work) can wear the striped uniforms. Those who really cannot work could receive an appropriate number of uniforms per year. Heck, I've never understood why prisoners who show promise as to rehabilitation cannot be allowed to earn a wide range of prison-appropriate items and/or privileges (beyond things prisoners can currently buy in the commissary) via working harder. Again, just like what normal, honest folks tend to do in the real world. If the admittedly laudable goal is to help those prisoners who wish to help themselves rehabilitate and enter society, why not allow them to learn the benefits of working harder and earning more? Yeah, I know, too much common sense to make "sense." At one time the stripes cost more. But the legislature voted to make the change. I’m ok with changing as the stripes need replacing if the new cost less. I don’t buy new until I need new. Anyone notice how her behavior closely mimics that of Marshal Fisher? We don't need no danged transparency over here in my agency. Ain't nunya bidnis what goes on. Pelicia is a clone of Fisher. He trained her and still calls the shots. You can believe it or not. I agree with Ms Hall. They aren’t “convicts.” They are murders, rapists, child molesters, armed robbers, etc. Let’s get away from that mean old term “convict” and call a spade a spade. Put their crime on their clothes. That’ll solve the issue. Please stop being stupid. Just change the name on new clothes. Don’t waste tax payer money to change them all at once. I live on a fixed retirement income each month.. If I over spend before the end of the month I run out of money & have to each bologna sandwiches too (2:36 PM). I'm not complaining, but I buy all my clothes at Goodwill. This is because I live within my budget. I really hate that paying all these taxes I pay from my income goes toward such CRAP like designer clothes for convicts. Maybe, convicts should wear the Mississippi State flag on their back. Wouldn't the rest of the nation be livid over this. Our elected officials get crazier & crazier with each vote. 10:07 maybe if you would have worked a little harder and planned better, you might have more income in retirement and not have to shop at goodwill while eating bologna sandwiches (and not complaining). Thank goodness you can afford your cellphone and/or wifi so you can espouse your views on JJ. If you have a problem with your fixed retirement income, go back to work. Saw a nice man working at the liquor store yesterday in his 80s. In today's world, we have shifted the paradigm from that of bringing in consultants to work with the management team to one of using mentors. It's entirely common now for a hiring authority (Bryant) to appoint a mentor (Fisher) to work with, guide and tutor an employee in training (Hall). However, the most effective management model requires a knowledgeable hiring authority, a competent mentor and a trainee with demonstrable potential. In this case, Mississippi has none of the three. Will someone please volunteer to write on the sheets I've taped to the wall while we move through this Power Point? Marshal? Anyone? Look closely at the photo posted at the top of this thread. I just can't decide what it is but something seems to be wrong with it. Reckon what it might be? This is what happens when you put a feelings-motivated, "politically-correct" appointee in charge, instead of an experienced person who fully understands the need to properly punish lawbreakers.